These honey roasted cashews take snacking to a whole new level. 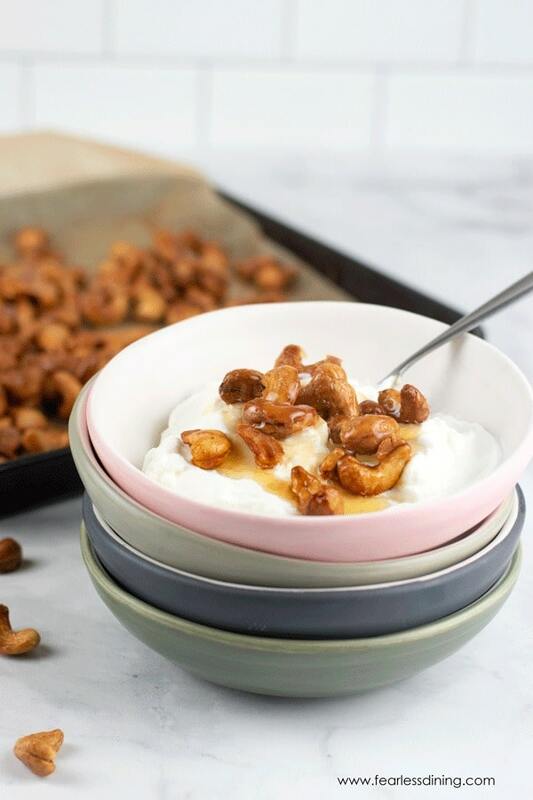 Crunch sweet honey glazed nuts are perfect for a party, lunchbox, or on top of thick creamy FAGE Total Greek Yogurt! Crunchy with just the right amount of sweetness, you will love how easy this roasted nut recipe is to make! 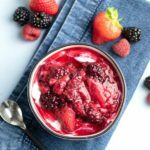 Today I am talking yogurt toppings, and how the right yogurt topping can make plain Greek yogurt taste just like dessert! You remember me…the crazy one who loves dessert for breakfast :-). 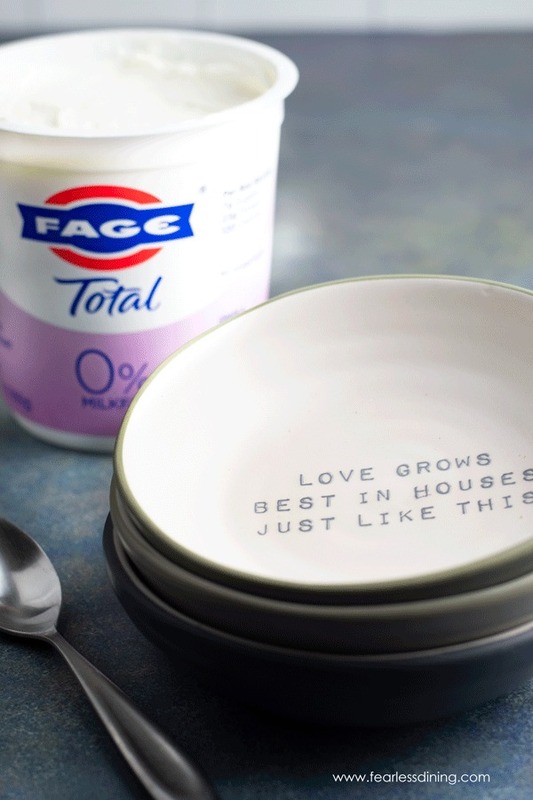 FAGE 0% Total Greek Yogurt is a thick and creamy all-natural yogurt that has quickly become our family favorite. It is Non-GMO Project Verified, has no added sugars, and it pairs with all of your favorite yogurt toppings! 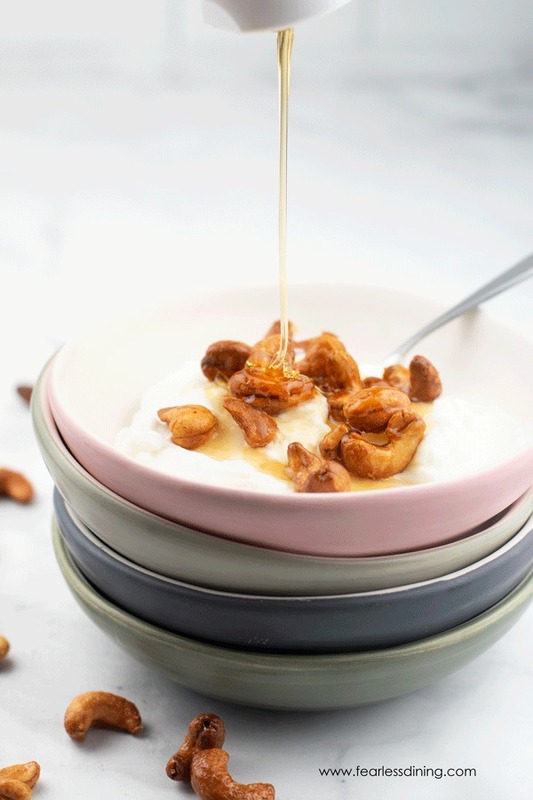 Our school mornings are busy so quick and easy breakfasts like this Greek Yogurt Bowl recipe is a perfect match for us. 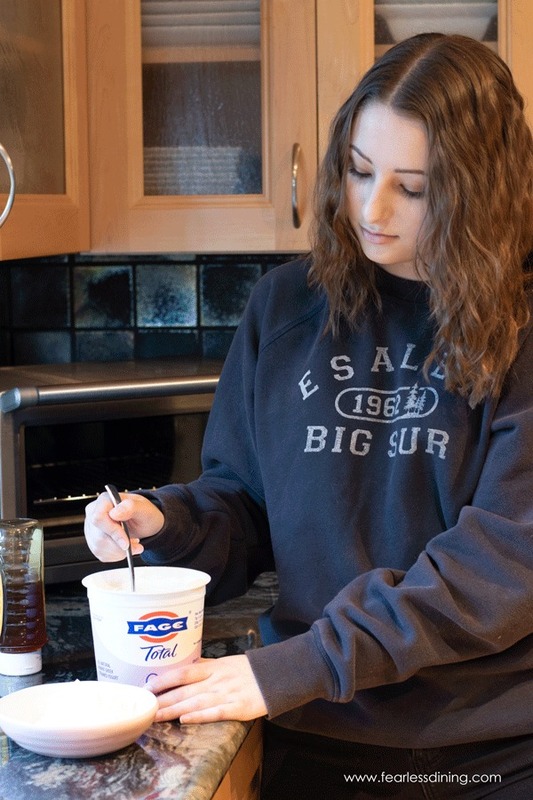 When topping yogurt, I like to pick naturally sweetened ingredients. It keeps sugars low, and this yogurt bowl makes a healthy breakfast or post-workout boost. You can top yogurt with fresh fruit, nuts, granola, peanut butter, and even hazelnut chocolate spread! 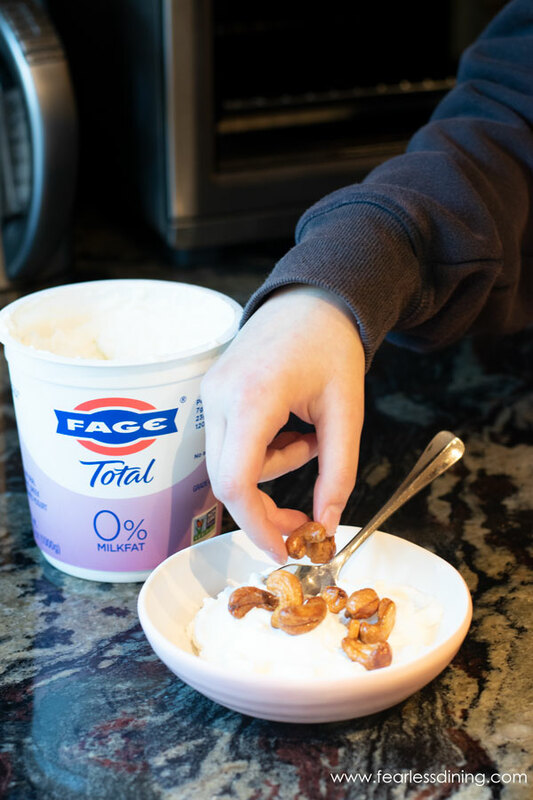 My kids like it when I set up a toppings bar so they can choose their favorite FAGE Total Greek yogurt toppings…it is a win-win for me because I know my kids are having a healthy breakfast before heading off to school. Nuts are a great source of protein to keep you going all morning. 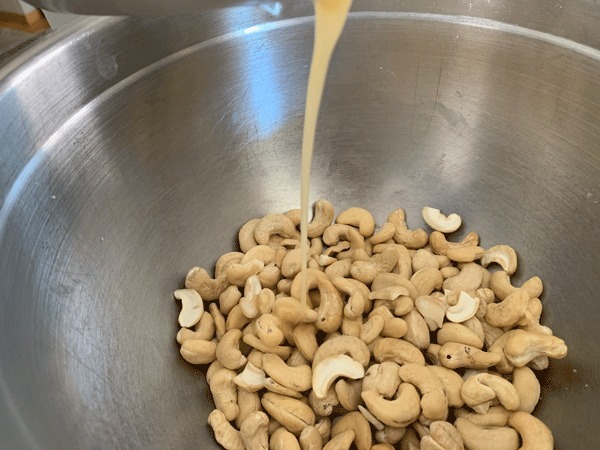 We are going to cook honey glazed cashews as a new fun way to top our yogurt. 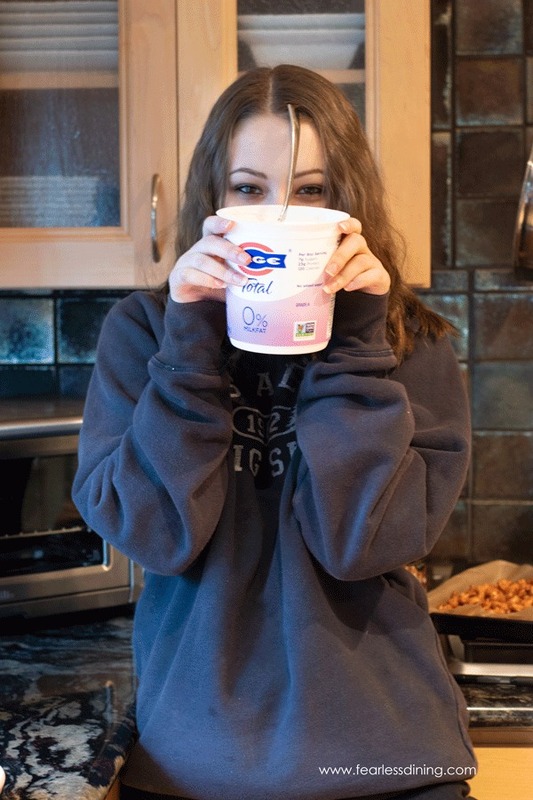 Breakfast is always entertaining in our house…my daughter was getting impatient with my picture taking and wanted to have the yogurt bowl right away :-). 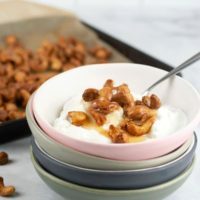 This honey roasted nuts recipe is easy to make, and you can vary it a bit by adding different flavors such as salt, cinnamon, cardamom, or even cocoa. What kind of nuts are best for this honey roasted nuts recipe? Are you ready to see how to make this healthy roasted cashew recipe? It is so easy. I like to use raw nuts when roasting nuts because it allows a little of the flavor to soak in. I used 2 1/2 cups of raw cashews. Pour them into a bowl. Melt 2 tablespoons butter and 2 tablespoons honey in a small dish. Pour the honey onto the nuts. Toss in 1/8 teaspoon salt and mix well. Dump the cashews onto a parchment paper lined baking tray. Spread the nuts out so they take up the whole baking sheet. Bake at 300F degrees for 8 minutes. Remove the tray from the oven and stir the nuts. Re-spread them out and bake another 5 minutes. Remove from the oven. Be careful, the nuts are really hot. How do I know if the nuts are roasted? When the nuts are hot, they will still seem soft and you may wonder if they roasted. As they cool and the honey hardens, the nuts will crisp up too. 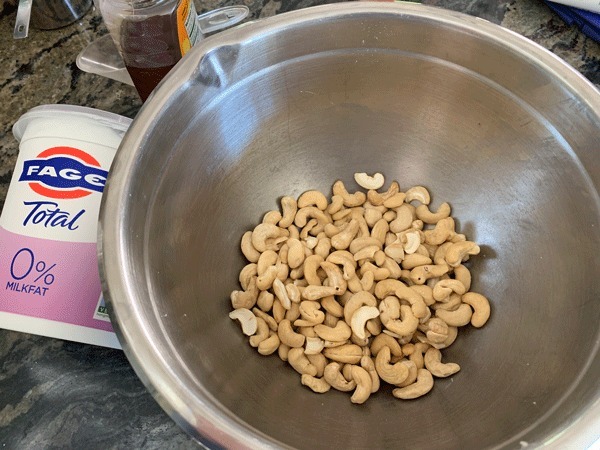 You may have some questions when making this roasted cashews recipe. I will try to answer as many as I can for you. How long do you roast the nuts? You will want to make sure to bake the nuts for 8 minutes. Remove them from the oven and stir on the baking sheet. Put back into the oven for another 5-8 minutes. 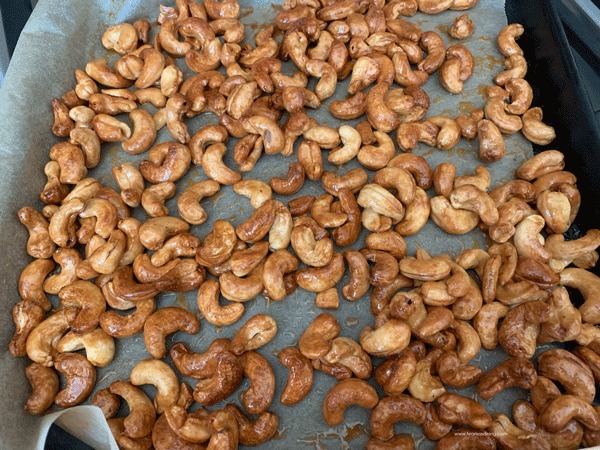 I like to roast honey cashews on a piece of parchment paper. When the honey bakes in, it is sticky and this can make your pan hard to clean. If you want to pan roast your cashews, you can do this in a hot cast iron skillet. Heat your skillet with a teaspoon of coconut oil (or light oil) toss the raw cashews coated in honey and butter into the pan. Stir frequently for 8 minutes. Can you roast a combination of nuts? Yes…there is a list at the top of this post of great ideas for nuts. 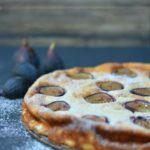 You can even add coconut flakes and seeds to make it fun! How long will the nuts keep after roasting? I like to keep the nuts in a mason jar with the lid screwed on. The nuts should keep up to 3 days if they last that long :-). Are you ready to roast some cashews? An easy tutorial to show how easy it is to make homemade honey roasted nuts. Honey roasted cashews are great for snacking. In a small microwave-safe bowl, add the honey, salt, and butter. Microwave for 25-30 seconds until the butter is melted. Pour the honey mixture onto the nuts and toss to coat. Bake for 8 minutes. Remove from the oven, stir the nuts and bake another 5-8 minutes. You had me at cashews and honey! I love roasted nuts and I’ve been so stuck on Maple Pecans and Walnuts but cashews are a favorite. I’m making these this weekend, so versatile for snacks or topping pretty much anything. This is totally my kind of food. We inhale cashews in my house and honey is my preferred choice in sweetener. 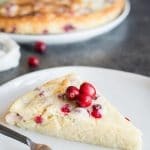 A perfect topping for my morning yogurt! My kids weren’t too sure about using honey, but there were easily convinced after trying them. Cashews are my favorite, and roasted nuts of any kind are high on my list of Delicious Snacks! 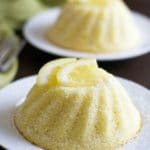 I can imagine how good these are with yogurt, Sandi! 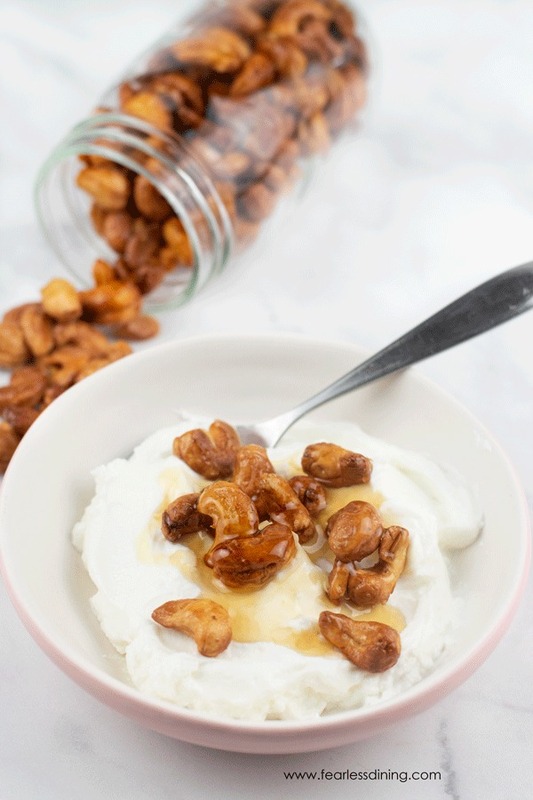 I love roasted cashews, these are awesome with coconut yogurt. So good! This is one of our favorite snacks!